Introduced in 1986 at the Geneva Motor Show, the V8 Zagato sports car was based on the Aston Martin V8, which was produced from 1972 to 1989 in five successive Series. Following in the tradition of the DB4 GT Zagato of 1960 to 1963, the renowned Italian coachbuilder Zagato was approached to create a lightweight race version of the V8 model, which would be capable of competing with Ferrari on the track. Like its DB4 predecessor, the chassis was shortened such that the overall size of the car was reduced, the result of which meant that the rear seats were removed. Furthermore, in order to accommodate the Weber carburettors, it was necessary to incorporate a large "power bulge" on the bonnet, which many customers disliked. The result was a luxurious, all alloy grand tourer, with a curb weight reduced by about 10% to 1590 kg, and priced at $157,000, with a modern design that incorporated an eye-catching square grille. 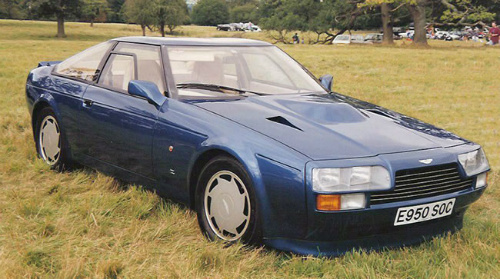 As part of the Zagato characteristic design, the roof section incorporated two distinct bulges above the driver and passenger compartments to allow for the wearing of crash helmets. When production concluded in 1990, a total of 52 coupes and 37 of the Volante convertible, introduced in 1987, had been built. An interesting historical fact was that, owing to limited production, many examples were acquired by speculators who held onto them for a couple of years in anticipation of the inevitable increase in valuation. In fact, by 1989, V8 Zagato sports cars were changing hands for as much as £0.5 million, a far cry from the original price of £70,000. Like the Aston Martin V8, the Zagato was powered by a 5.4 litre, DOHC, V8, X-Pack engine that developed 432 bhp at 6000 rpm, and 395 ft/lbs of torque at 5100 revs. Linked to a ZF five speed manual gearbox, four twin choke Weber carburettors, and a 10.5:1 compression, it produced a top speed of 186 mph, with 0-60 mph in 4.9 secs. In 2014, a 1986 Aston Martin V8 Zagato sports car, in showroom condition, sold at auction for £248,000/$397,000, whilst in 2013, a 1989 V8 Zagato Vantage Volante sold at auction for £136,000/$218,000.